I noticed that the onions I planted last fall with the garlic as an experiment have developed some weird growth on the stems. Now they are shooting out sprouts from the weird growth! What variety is this? 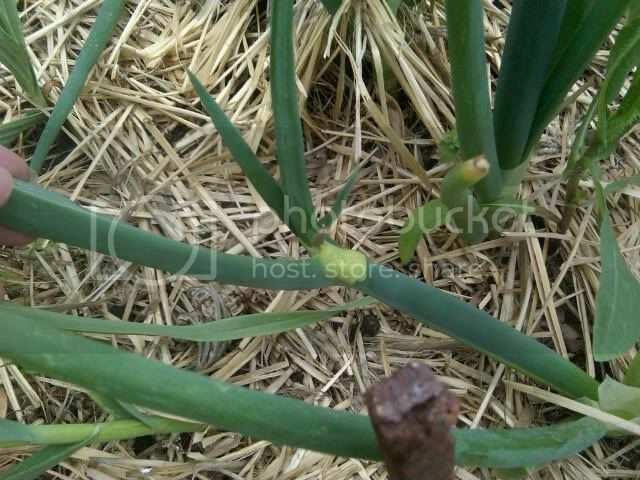 Onions bloom on top of the leaves. Some varieties form bulbils too. Here are some examples. Any way your onion is trying to propagate by one of the methods that onions use. jal_ut wrote: What variety is this? Onions bloom on top of the leaves. Some varieties form bulbils too. Here are some examples. Do Egyptian Onions make large bulb slicing onions? Can the bulbils be used to grow more onions? James, I have no idea what variety this onion is! I planted them from bulbils someone gave me last fall as an experiment when I planted the garlic. They make pretty tasty green onions so far. I've seen seed heads on onions before but never have I seen them growing more leaves out of the original leaves. I think you have Egyptian onions. Here are a couple of pics of Egyptians. They have loads of bulbils on top. I keep a few adult plants around to make bulbils which I keep planting to make green onions. This is the adult group. They make lots of bulbils. These are the green onions ready for harvest. I plant them quite deep so there is a good long white portion on these onions. One more pic. These are all cleaned up. Nice onions. The Egyptian Walking Onion will also propagate in place won't it? I've heard of people simply planting a patch of them and then harvesting their needs from the patch with the knowledge that the empty spot will soon be filled with a new onion. One guy told me he is still harvesting from a patch his father planted many years before and the patch stays the same year after year. No. They seldom get any thicker than your thumb. These Egyptian onions seem to have the deepest green leaves. I was getting a leaf or two for my stir fry yesterday and accidentally pulled off a bulbil/flowerstak! Good thing there are more. I'm planning on keeping these as the mother clump (they're planted around a dwarf peach). I'll have to remember to deep plant their bulbils -- sounds like a great plan. You can plant the bulbils any time. I usually plant some monthly, then I have a continual supply of green onions. They will keep quite well on the parent plant until you need them, or you can pick them and put them in a box in the garage for later use. You can eat the bulbils too. It is a great onion. Get some of these and never run out of onions. I've never grown the Egyptian onion, but I've read a lot of glowing reports about them. I probably won't grow them because I don't have a space in my garden to permanently plant anything. I redecorate every fall. I am curious if the Egyptian onion will make slightly larger bulbs if they are planted shallow instead of deep as you do. I understand why you plant deep to get the extra white length of stem. Would they grow differently if planted shallow? "You can plant the bulbils any time." Would they grow differently if planted shallow? No! They do not bulb. This may be a totally obvious question, but can you eat the bulbils, or do you only eat the stems as green onions?